Check out Tobi's Kensey Oversized Tee Stick to the basics. The Kensey White Tee is our go-to shirt this summer! This oversized shirt features a slouchy fit with a deep v-neck and open back on a soft and stretchy rayon knit. Tuck this comfy shirt into mom jeans or wear with leggings for a relaxed look. Stick to the basics. The Kensey Black Tee is our go-to shirt this summer! This oversized shirt features a slouchy fit with a deep v-neck and open back on a soft and stretchy rayon knit. Tuck this comfy shirt into mom jeans or wear with leggings for a relaxed look. Stick to the basics. The Kensey White Tee is our go-to shirt this summer! This oversized shirt features a slouchy fit with a deep v-neck and open back on a soft and stretchy rayon knit. Tuck this comfy shirt into mom jeans or wear with leggings for a relaxed look. Stick to the basics. 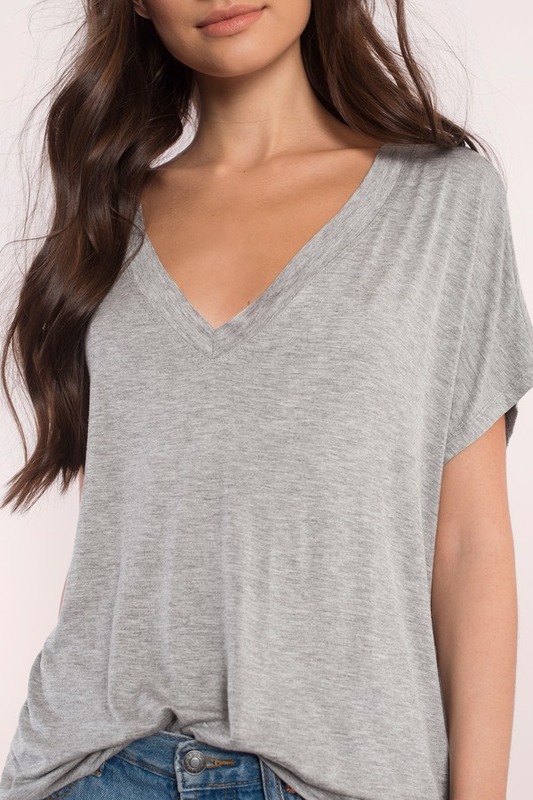 The Kensey Heather Grey Tee is our go-to shirt this summer! This oversized shirt features a slouchy fit with a deep v-neck and open back on a soft and stretchy rayon knit. Tuck this comfy shirt into mom jeans or wear with leggings for a relaxed look.